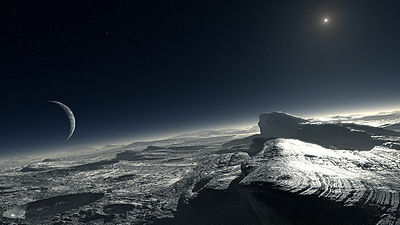 In 2006, the International Astronomical Union announced a new scientific definition of the term “planet” – a definition that excluded Pluto on technical grounds. Outrage and despair erupted! What those hard-headed scientists didn’t understand was — hey, we grew up with Pluto. Pluto’s everyone’s favorite! It’s the little guy out there, doing his best! And it’s the period on the end of the long sentence that is the Solar System, the necessary stopping point beyond which is all ice and chaos and emptiness. Or so it seemed to us, anyway. There was even a petition you could sign here to keep Pluto defined as a planet. That fight is over now. But we still love Pluto, don’t we? NASA’s New Horizons mission to Pluto was launched in January of 2006. In January 2007, traveling at more than 36,000 mph, the craft crossed the orbit of Jupiter. New Horizons will arrive in the Plutonian system on July 14, 2015. As part of its payload, the ship is carrying some of Clyde Tombaugh’s ashes. Charon was discovered in 1978; in 2005, the Hubble Space Telescope discovered two more moons, Nix and Hyrdra.